In this video, Salim gives some background on how Plan Kwale has been using ICTs in their programs since 2003 (1:11). He shares ideas about the potential of new ICTs (3.42) and some key lessons learned since 2003 (5.03). Watch the video to get the advice straight from Salim. Or if your internet connection is slow or you’re like me and you like to skim through an article rather sit still and watch a video, the transcript is below. 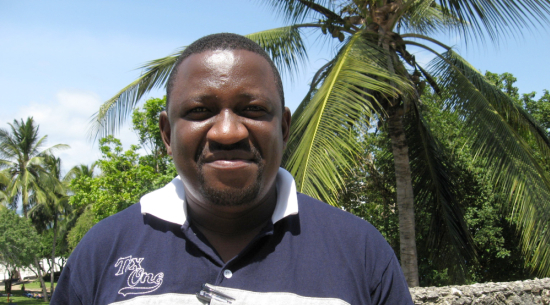 My name is Salim Mvurya, I’m the Area Manager for Plan in the Kwale District. My core responsibility as an area manager is to provide leadersip to the Kwale team in both program issues and also operational issues within the organization. This week we have been here in a workshop where we’ve been focusing mostly on issues of ICT for development and particularly what we’ve been learning here is the issue of mapping. We’ve also learned Ushahidi. We’ve also learned from our colleagues in Kilifi on mGESA (a local application of mGEOS that Plan Kenya, Plan Finland, University of Nairobi and Pajat Mgmt are developing) and basically we have been looking at this workshop as providing opportunities for using ICTs for development, but more particularly for us in Kwale is the issue of child protection and youth governance. How has Plan Kwale been using ICTs for issues of child rights, child protection and child participation? ICT in Kwale has a bit of a long history and it’s because of the issues on child rights. Kwale has a number of issues. Child marriages, issues of violations of child rights through sexual exploitation, and child poverty. So the efforts to do media started in Kwale in 2003 when we rolled out our first video that was done by children at the time to profile some of the issues of child marriage. But more importantly in 2005, we began to think greatly how we can bring the voices of children to duty-bearers and at time we thought of having a children’s community radio. Because of lack of experience, we were thinking maybe at the end of that year we could launch the radio station. But then it took longer than we envisioned because we needed to roll out a participatory process. Alongside the same time, we had ideas of community-led birth registration which was being done in one community based organization. But later we also thought about looking at how ICT can help us in moving that direction. Then we also had this idea of inter-generational dialogue, where children and youth can sit with duty-bearers and discuss critical issues affecting them, so we began using youth and video there, children and video, and showing those videos in a community meeting where then people could discuss the issues. Alongside the same time we were partnering with various media houses and also rolling out radio programs where people could listen and also foster some discussions on children. So it’s been a long journey but I think what we are seeing is that we need now to consolidate the gains, the experiences and efforts so that we can have a more strategic approach to ICT for Development and this workshop basically provides us with an opportunity and a platform to think much more. What potential do you see for some of the newer ICT tools for your work in Kwale? I see great potential in some of the tools that have been learned here this week, more particularly to get information at the click of a button from the ground. We could use the tools to map out resources out in the community, to map zones where there are a lot of issues on child protection, areas where we have issues like low birth registration… There is great potential for the tools that we’ve learned here to assist us not only in planning for projects, but in issues of social accountability. For example if you map out the areas where we have projects for Constituency Development Fund you can easily see where we have projects that have been done well but where we also have projects where maybe communities will need to discuss much more with duty-bearers to be able to, you know, foster issues of social accountability. What are your biggest challenges? What mistakes have you made? One thing that we’ve been learning in the process… well, you know sometimes we have ideas that we think can work in the next week, like for example the children’s community radio when we were thinking about it we were thinking that it could take off in about 2 months. But what we learned is that there are processes to be involved. Communities have to be prepared well for sustainability. Children have to be trained, there needs to be capacity building. You have also to conform to government procedures and processes. So I think it’s very critical when somebody is thinking about ICT for Development that, one, you look at the context: is it relevant to that area? What kind of skills are needed? What kind of processes for sustainability? but also getting the passion. Getting people who are passionate to lead the process is also a very critical lesson.